And here is my September art video! I used Beethoven's Sonata Pathetique. It is one of my favorite Beethoven sonatas. When I first took piano lessons as an adult in Michigan, this was one of the pieces I learned to play. My hands are small so some of this is difficult to play as I had to stretch my hands. I hope you enjoy the video! 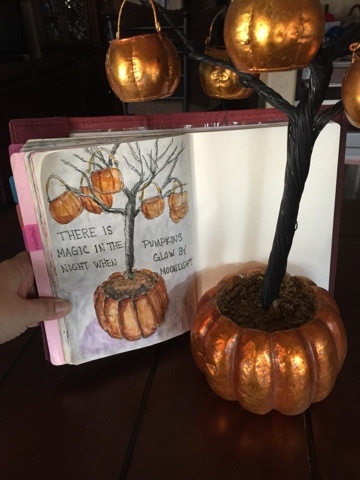 I love the pumpkin tree. I have never been hugely into decorating because of a lack of time, but my mother really loved things like this. Your pumpkin tree brought my mother to mind. I think this may be the first year when all three kids will not be trick-or-treating. But I still like to decorate and greet the kids coming to our house. I hope you were remembering happy memories!